You may remember this highway safety campaign: "55 saves lives." Well, a new study suggests new speed limits of 65, 75 and 80 mph do not. There was a time in the United States when there was a lot of buy-in to a national traffic safety campaign, geared at reducing high-speed traffic deaths. But the public tired of that idea. And that speed limit, immortalized in the 1984 Sammy Hagar song “I can’t drive 55,” seems to be a relic of a bygone era. Since the 1980s, highway speed limits have ticked upward. A recent report by the Insurance Institute for Highway Safety found that over the past 25 years, nearly 37,000 lives have been lost as speed limits have crept upward. The report said that currently, 41 states have maximum speed limits of 70 mph or higher. Six states have 80 mph limits, and drivers in Texas can legally drive 85 mph on some roads. 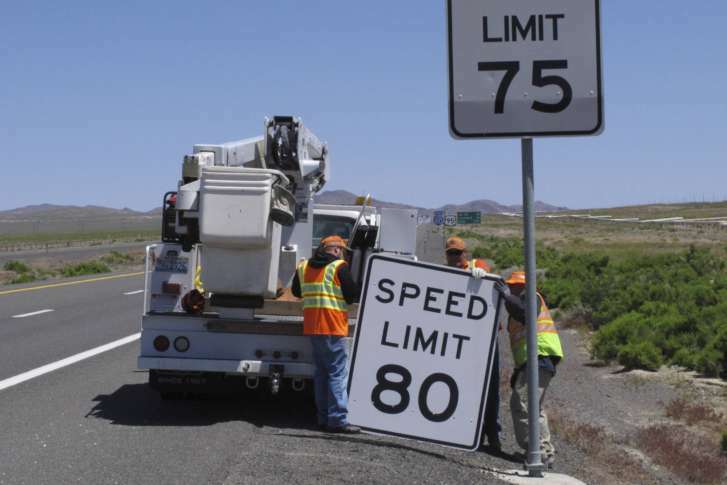 The study finds a 5 mph increase in the maximum speed limit was associated with an 8% increase in the fatality rate on interstates and freeways, the roads most directly affected by changes to the maximum speed limit, and a 3% increase on other roads. While many drivers can’t stand to drive 55, Charles Farmer of the IIHS did the math, and he suggests racing around the Capital Beltway may not be worth the risk. The higher speed doesn’t result in that much time savings compared to the increased danger. “Driving 70 instead of 65 saves a driver at best six-and-a-half minutes on a 100-mile trip,” Farmer said. Darrin Grondel chairs the Governor’s Highway Safety Association’s Executive Board and is director of the Washington Traffic Safety Commission. He thinks states need to think again about speed limits. “Speeding has become almost a forgotten issue in traffic safety discussions, and clearly we’re losing any sense of limits,” Grondel said. The study comes ahead of a meeting in Charlottesville, Virginia, later this month organized by the IIHS and the Governor’s Highway Safety Association designed to brainstorm a model speed management program.